What makes the perfect cheese platter? If you’re not one with a sweet tooth, be safe in the knowledge that we have an assortment of fine cheeses to bring you pleasure when dessert comes around. 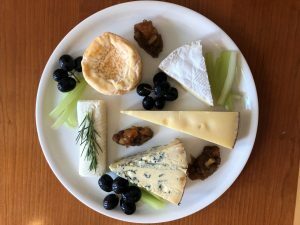 We’ve also got some top tips on what makes a perfect cheese platter as well as some mouth-watering pairings, perfect if you’re planning a dinner party. We would advise to allow 100g (3½) cheese per person if your cheeseboard is being served after a meal, or 150g (5oz) per person if you’re serving as part of a cheese and wine evening. There should be 4 or 5 cheeses on offer – more than that and there’s too much for the palate to enjoy. Ensure your choices include different styles, textures and flavours. The combination of Cheddar, Stilton and Brie is a classic as it mixes a hard, soft and a blue. See our recommendations below from our Hart’s Cheese Platter. This cheese has a full, nutty, tasty flavour with earthy overtones. The texture is firm and hard, very similar to Cheddar with a rich lingering after taste. This award-winning Stilton has a rich tangy flavour, and a velvety-soft texture that makes it melt in the mouth. This soft white cheese is compact, slightly moist and rindless. The taste is clean, fresh, lemony and redolent of wild herbs. A creamy, white bloomy-rind cheese hand-made on the farm by the Crickmore’s family, using the milk produced by their own Montbeliarde cow. It has a smooth silky texture and a golden curd, with long lasting earthy, farmyardy and mushroomy flavours. Premier Cheese washed and filled up the Fontaine of Marc de Bourgogne which gives the cheese a fruity alcoholic taste. The cheese develops a beautiful bouquet and the texture becomes creamier. 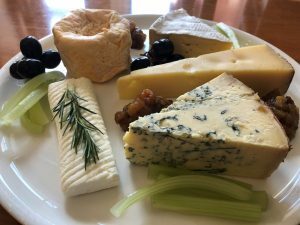 We serve our cheese platters with celery, grapes and Hambleton Bakery date and walnut sourdough and crackers as a well as our home-made pear and apple chutney. The main thing to remember is not to overload the cheeseboard with too many additions. What drinks are best served with cheese? – Provenance: Where was the cheese made? Try a drink from the same area to complement it, such as a cider from the Cheddar region. – Flavour matches: A sweet wine works brilliantly with blue cheese. – Versatility: A light red wine is a great all-rounder, as is a heavy white wine, as they give a good flavour and body without dominating the palate. Store in a cold room or the bottom of the fridge, wrapped in waxed paper if possible, so the cheese can breathe. Allow the cheese to come up to room temperature about 20 minutes before serving to improve flavours. One marriage no one can object to is the mouth-watering combination of wine and cheese. Each is delicious on its own, but when you pair the two, magic can happen. Be it light, sweet, or dry, you can bet there’s a wine out there for every cheese (even fondue!). 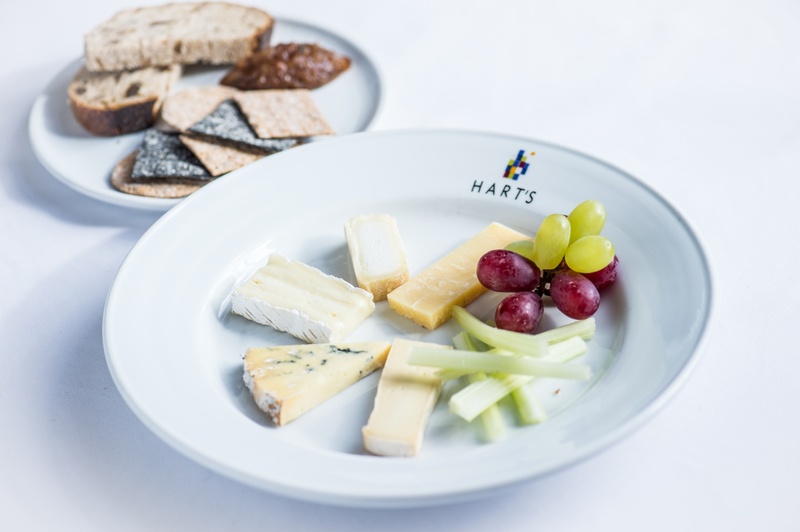 Explore the world of great wines and cheese at Hart’s Restaurant and see which wines we have paired with the lovely selection from our cheese platter. Our Italian friends have been quaffing Prosecco with their Parmesan for generations and Lincolnshire Poacher, with its slightly crumbly texture and fruity flavours (close your eyes, give it a sniff and think of pineapples!) makes the perfect cheese to enjoy with some bubbles. A rich tawny port is a perfect match for veiny blue cheeses. The soft sweetness found in Grahams stands up surprisingly well to the thick acidity of a hearty blue. A delicate and well-balanced Pinot Noir is a must to complement but not over-power the subtle flavours of this fine English Brie. Perfect on a warm summer evening in the garden! The soft, fudgy texture and the moreish tanginess of this French goat’s milk cheese are the perfect match for a zippy, citrusy new world sauvignon, bringing out the very best flavours from the cheese. A soft, washed rind cheese like Langres la Cave needs a couple of things from its team-mate to really shine. First it needs a touch of mineral earthiness to steady the punch from the rind. Secondly it needs a decadent, full-bodied finish to really bring out the best in the buttery treasure that lies beneath the rind. Luckily for us, this Californian Chardonnay has both of these things in spades! Why not try our selection of English and French cheeses when you next visit us here at Harts. Book your table online here.